At the International Exhibition BaselWorld 2012 the Swiss watch company Breitling introduced the model created in cooperation with the automobile concern Bentley – Watch Bentley SuperSports. Breitling and Bentley – the most famous producers of “luxury.” Cooperation between the two famous companies – anticipated event, which marked the beginning of the style, speed and power in the new version. 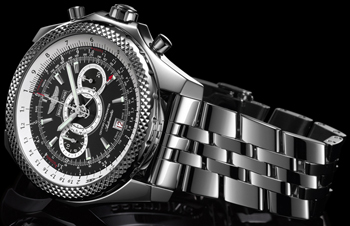 As part of a successful and fruitful partnership between the two most powerful companies in 2002 was created several series of exclusive watches Breitling, whose ranks expanded model of the Bentley SuperSports, limited edition of 3,000 copies. 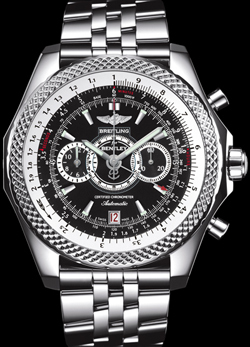 Watch Bentley SuperSports presented in stainless steel (diameter 49 mm), “ringed” fluted bezel, reminiscent of typical control buttons glorious Bentley. The housing set of functional chronograph automatic movement Breitling 26B, certified by COSC (Official Swiss chronometer testing institute). Caliber is based on 38 stones and running at 28 800 pc / h The mechanism has the following functions: hours, minutes, seconds, date, chronograph. Pointers functions harmoniously integrated into the watch face, “fringed” tachymeter scale. Along with the traditional fixed tachometer, a clock is also equipped with a variable tachometer with a circular slide rule, which allows to measure the average speed at any given time, and distance traveled and maximum speed. Watch Bentley SuperSports completed with a metal bracelet. There is also a version with leather and rubber strap. The model is waterproof to a depth of 100 meters.